At a time of global uncertainties and erosion of liberties, how will cultural studies clear a space for a parallel intellectual and political engagement with human rights practice? How will human rights thinking be liberated from its doctrinal approach to ethics and legal justice? This book forges an alliance between cultural studies and human rights scholarships, to help us better understand the changing and complex political context that continuously shapes contemporary violence. To date, interdisciplinary dialogue or institutional collaboration remains rare across the two domains, resulting in critical interpretive work appearing too vacuous at times and institutional legal work often trapped in doctrinalism. By opening a door for a new and engaging scholarship, this book will re-ignite debates and passions within communication and critical cultural studies in the search for global justice. 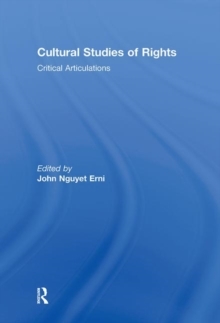 This book was originally published as a special issue of Communication and Critical/Cultural Studies.